So girls, which woman are you? 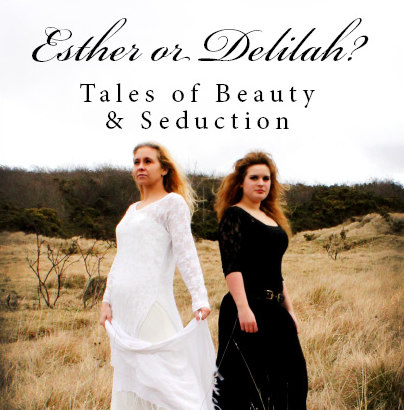 Are you an Esther or a Delilah? What do you use your beauty for? Do you use your beauty to help and save, to build up your man, to enable your man to make wise decisions? Or are you a Delilah, do you nag constantly and complain repeatedly until your poor husband can take it no more and he is pestered to the extent that his soul is vexed to death? If you are a Delilah, I can tell you now that your man is living as Samson did – in chains as a joke. He might even feel like he wants to use the last of his strength to kill himself! I am not joking. This is a serious matter and far more common than we care to admit. A man who has no strength has nothing and the thought of death is a comfort to him. Samson didn’t reach his full potential because he gave his strength to a woman. Instead of standing up to her or in this case fleeing from her, he gave in to her. Men, even though your woman might drive you insane as she tries to get her own way, don’t give in. Deep down inside she doesn’t want to have her own way, she is just testing your strength because she needs to know that you are capable of being strong for her. If you are married to a Delilah you can’t leave her but you can stop her from taking your power! A strong woman can only operate where there is a weak or passive man. If your woman is taking your strength from you it is because you are letting her. Stop allowing it men. You are not designed to be a wimp, you are not designed to be weak and you are not designed to be passive. You are a warrior so start acting like one! If you allow your woman to act like a Delilah you are robbing her. She has the potential to become an Esther if you will rise up and be strong and courageous. It will feel weird at first, you might even feel like you are being mean, but as long as you are not being mean and are only being strong, you are on the right path. Can I tell you men a little secret? Women don’t want to have their own way all the time. And another little secret, you can never be the only source of a woman’s happiness. You could spend your entire life trying to please her, you can exhaust yourself trying to make her happy, only to find out at the end of your life that it was a mission impossible. You weren’t designed to keep her happy, you were designed to be strong for her, which may at times mean not giving her exactly what she wants. If you carefully consider your woman’s request and make a decision to give her what she wants because you feel it is right – great! BUT if she pesters you and nags you and you give in to her against your better judgement then you are giving away your strength. Both you and she will suffer if you give away your strength and in the end, you could even lose the woman you love. Fight for her and show yourself the strong man that you are. Don’t cross the line and be mean and nasty, just stay firm and sure to be strong. I was mowing the lawn one day and meditating on this very book, realising that I had the potential right at that very moment to be either an Esther or a Delilah to my husband, to my children and to the men in my church. At once I prayed to God and asked him to please help me to be an Esther to my people! As I said the phrase ‘my people’ I chuckled thinking that I was no queen, who am I to say ‘my people’ like that! But I knew my heart, it was not an arrogant prayer but it was a sincere prayer and I sincerely meant ‘my people’ as I understood my role in many people’s lives. Perhaps you could also consider praying this prayer for your people. Yes, you have people too. People that look up to you, people that rely on you, people that you influence. You are always influencing people whether you like it or not, the key is to be a good influence and not a bad one. So who are your people? Perhaps you are at school and your school is your ‘kingdom’, the place where you can carry the saving love of Jesus to all the people. Perhaps you are a stay at home mum and don’t consider yourself to be ruler of much. I tell you the power of one woman in a family is enough to change an entire nation, be an Esther to your husband and children. It’s the same with children, spoilt children are unhappy children. Children that are disciplined in a loving way feel more secure and content in life. No matter how much us women try and convince our man that we want something, our men have to be strong and seek God for wisdom to know what is best. This takes guts, this is what makes a strong man. A man who has the strength to say no to his wife, even though it will displease her, is a strong man. Seriously, because he knows what is coming if he doesn’t give her what she wants. Perhaps some crying or some nasty words or some manipulation. Any man who can put up with that in order to do what is right is a real man in my eyes. Hopefully, us girls will learn to respect our men’s strength and we will minimise our emotional reaction to their leadership. We should admire this quality in a man and not resist it.